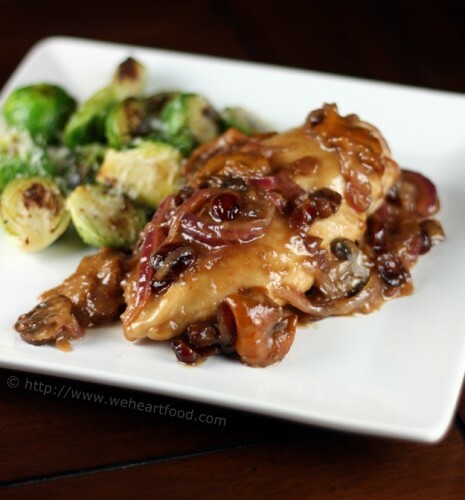 Now, I have no idea what “Nachatta” means, but this riff on Chicken Marsala, with cranberries, mushrooms, and a touch of cream, echoed the flavors of turkey and cranberry sauce and so made a fantastic main course for our Thanksgiving dinner. I found the recipe in the Seattle Celebrated Chefs Cookbook, courtesy of Amore. We served it with the previously-posted Thanksgiving favorite, Golden-Crusted Brussels Sprouts. Sigh… “sub” as in “substitute”. Yeah, I know. It’s called playin’ around. Heard of it? Anyway, I agree. It’s awesome! I heart the shrooms. Well *I* heart the cranberries. How about June? I’m predicting a busy first half of the year. May, June, Nachatta, Colada, whateva. It’s all good, as long as it happens eventually! Melt the butter in a medium skillet over medium heat. Add the red onion and cook until tender and somewhat browned, 8 to 10 minutes. Remove from the pan and set aside. Coat the chicken breasts with the flour, patting to remove excess. Add the olive oil to the skillet and heat to medium-high. Add the chicken breasts and brown, 1-2 mintues. Turn the chicken over, add the brown sugar to the skillet, and stir so that it melts. Add the chicken broth and boil until reduced by half, 1 to 2 minutes. Add the Marsala, mushrooms, onions, and dried cranberries. Bring to a boil, add the cream, and lower the heat to medium. Simmer until reduced by half and the chicken is cooked through, 8 to 10 minutes, turning once or twice. Season to taste with salt and pepper. Transfer to plates and top with the pan sauce. This lighter-version of a favorite comes from Eating Well, and was a great way to feel comfortable eating comfort food. The biscuit topping was a nice surprise, and the dish really tasted rich and creamy. I’m putting in my official request for Lisa to make this again. 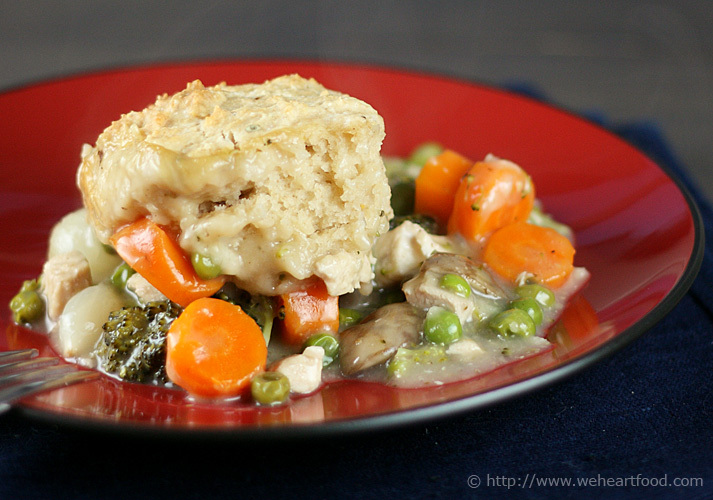 What the… did you really just make Chicken Pot Pie? …I was craving it! It’s a light version. Wow, well it looks awesome. Just wait until you taste it — it may be light but it’s pretty rich. Yeah it is! This is so good — though, I have a question. Is it still considered light if I have three helpings? To prepare filling, heat 1 tsp oil in a large Dutch oven over medium-high heat. Add onions and carrots; cook, stirring, until golden brown and tender, about 7 minutes. Transfer to a bowl. Heat the remaining 2 tsp oil in the pan over medium-high heat. Add mushrooms and broccoli and cook, stirring often, until browned and the liquid from the mushrooms has evaporated, 5 to 7 minutes. Return the onions and carrots to the pan. Add 2 cups broth and bring to a boil; reduce heat to a simmer. 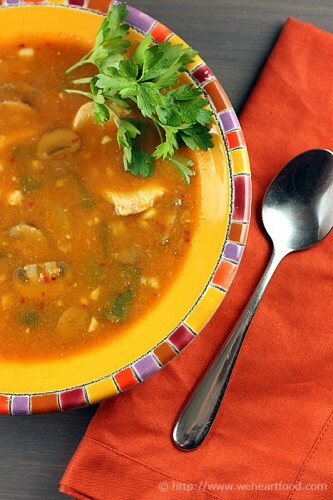 Mix cornstarch with the remaining 1/2 cup broth; add to the pan and cook, stirring, until the sauce thickens. Stir in chicken, peas, sour cream, salt and pepper. Transfer the filling to a 2-quart baking dish. To prepare biscuit topping & bake potpie: Preheat oven to 400°F. Whisk whole-wheat flour, all-purpose flour, sugar, baking powder, baking soda, salt and thyme in a large bowl. Using your fingertips or 2 knives, cut butter into the dry ingredients until crumbly. Add buttermilk and oil; stir until just combined. Drop the dough onto the filling in 6 even portions. Set the baking dish on a baking sheet. Bake the potpie until the topping is golden and the filling is bubbling, 30 to 35 minutes. Let cool for 10 minutes before serving. Here’s another good one from Almost Meatless : okra, chard, onions, and just a bit of chicken in a richly-flavored broth made with peanut butter and chicken stock. The recipe makes quite a bit, and was so good that in addition to Lisa, I brought in leftovers for lunch the following day! (Those of you who know us realize how monumental that is!) The original recipe calls for dark-meat turkey (attention to those of you looking for ideas for Thanksgiving leftovers! ), which we substituted for chicken. Yum, this sauce is so good — and the rice just soaks it all up. 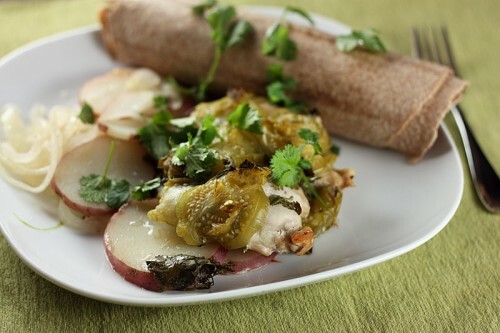 Yeah, I really like this — and even though you’re not the biggest fan, I heart the okra in it. Hey, I guess I won’t have to have my ritual spoon of peanut butter tonight! Ha, guess not — and although you definitely taste the peanut flavor in here, it’s not like those Thai peanut sauces that are *super* peanutty. Nope — definitely not… not that I’d mind. I’m glad this is “almost” meatless, I’m almost ready for another vegetarian week. …I’ll gladly eat whatever you aren’t in the mood for! Hey, fork off! I didn’t say I was ready for vegetarian week just yet…! Heat one tablespoon of the oil in a dutch oven over medium-high heat. Add the chicken and cook for five minutes, until lightly browned. Transfer meat and juices to a plate. Add the 1/4 cup water and deglaze the pot, scraping up the bits from the bottom. Pour the liquid and bits over the chicken and set aside. Add the remaining tablespoon of oil to the pot, add the okra, and saute for five minutes on medium heat, until it starts to look sticky. Add the onion and saute another five minutes. Pour in 1/2 cup of the stock and deglaze the bottom of the pot. Add the garlic and cook until fragrant, about a minute. Stir in the spices, tomatoes, peanut butter, reserved meat and juices, remaining stock, and chard. Lower heat to medium-low and simmer for 45 minutes. 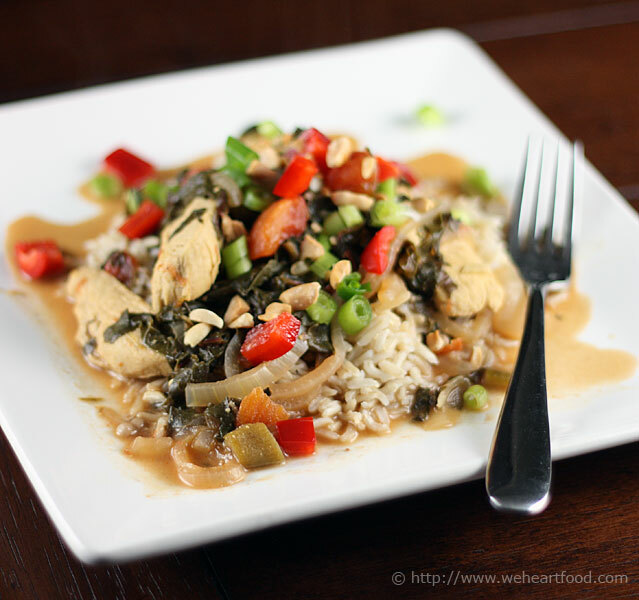 Serve over brown rice and garnish with red bell peppers, chopped peanuts, and green onions. This is a perfect recipe to adapt to the vegetables you happen to have on hand. Our CSA box came loaded with corn on the cob and mushrooms, so I modified a recipe from Rick Bayless’s Mexican Everyday to use the fresh vegetables of the day. As the book suggests, one of the great things about this soup is that once you master the base broth, the variations are limited only by your imagination. Wahoo! I love walking in the door to a meal that’s ready to go! I like not feeling rushed on nights that you’re home late. Shouldn’t be — ancho powder is relatively mild; it has a slightly smokey flavor. Mmmmm… the masa harina really gives it a nice consistency. Totally — and the flavor goes really well with the fresh corn kernels. The starch from juicing the cobs also helps thicken it. I like how thin you cut the chicken. Yep — it cooks pretty quickly that way. Well this soup is disappearing pretty quickly this way. Husk the corn. In a shallow bowl, hold ears of corn upright and, with a sharp knife, cut kernels from the cobs. Then with blunt edge of the knife, scrape juice from cobs. Discard the cobs. Heat oil in a large saucepan over medium heat. Add onion and garlic and cook, stirring until golden, about 7 minutes. Transfer the onion and garlic to a food processor or blender. Add chile powder, masa harina, and 1 1/2 cups broth; process until smooth. Return the puree to the saucepan. Bring to a boil over medium-high heat, stirring constantly, until slightly thickened, about 2 minutes. Add the remaining 2 1/2 cups broth, mushrooms, corn kernels and juices, poblano pepper, and parsley and return to a boil. Reduce heat to medium-low and simmer for 10 minutes. Stir in chicken and continue to simmer until cooked through, 6 to 8 minutes more. Taste and add salt if needed. Remove parsley and ladle into soup bowls.